I'm big on practically in a vehicle (unless its a sports car). Thus, the mid-size front-drive two door field of cars has always been a bit of an anomaly to me. They're not as sporty as a true rear-drive sports car, and not as practical or roomy as a sedan. They're essentially two-door sedans meant to have a sporty look. And that's fine if that's what gets you going. This FWD coupe genre has gotten significantly smaller in the last several years. 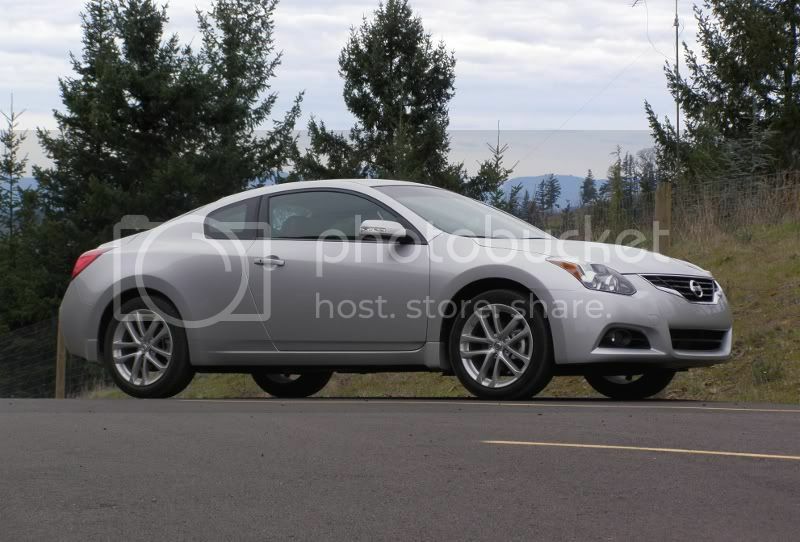 The only currently available models in this class are the Honda Accord Coupe, the Mitsubishi Eclipse, and this Altima Coupe. This segment used to be much bigger several years ago, and was populated by cars such as the Chevrolet Monte Carlo, Pontiac Grand Prix, Mercury Cougar, Toyota Solara, Hyundai Tiburon, and Chrysler Sebring. These cars bowed out of the market a couple of years back leaving the territory solely to the Accord and Eclipse. In 2008, Nissan decided to join this seemingly shrinking fray with its Coupe version of its popular Altima sedan. For 2010, Nissan made some changes to the 2010 Altima Coupe, and hopes to draw in folks looking for two-door version of its popular Altima sedan. At first glance, the Altima SR coupe, especially in silver, slightly resembles a 350Z. From the rear, it kind of resembles an Infiniti G35 coupe, too. Unfortunately, the Altima Coupe, even in the upper SR trim level with small side skirts and 18-inch wheels, doesn't look as good as either the Z or G35. The look is is about one step short of sporty. There's a lot of unsightly gap between the top of the tire and bottom of the fender which makes the car look like it rides higher than it really does. Plus, the front end looks like it sits higher than the rear. It just doesn't do it for me. In the coupe's defense, about half of the people I showed the car to thought it looked great. 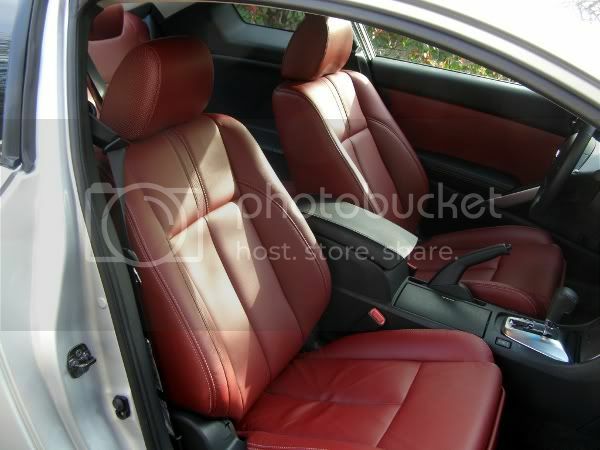 My review vehicle's SR trim included a gorgeous reddish/brown leather and black motif that looked gorgeous. The well-bolstered front seats felt great, and the dash looked like a toned-down version of the Z car's. This is a four seater, and the rear seats are not as tight of a squeeze as they look. The trunk, on the other hand, was very small. I could barely get my acoustic guitar case in it. Plus, the speaker housings hang down low, which eats up cargo space. Unfortunately, the car had a fair amount of rattles, and some of the interior bits felt a bit plasticy, such as the center console. Additionally, while the heated seats are great, the on/off switch for the driver's side was located right under the e-brake handle, making operation difficult if the handle wasn't up. Additionally, my wife complained about the seat belts being hard to grab, and uncomfortable. Instead of using an adjustable anchor, like many cars, the Altima Coupe uses a funky tilting mechanism. They don't work all that well. My 3.5SR Coupe included some good stuff on the tech side. The RearView camera worked very well, and the picture gets displayed on the dashboard's 4.3-inch display. That color display is also used for the stereo controls. It was extremely easy to read and operate—all stereo interfaces should be this good. 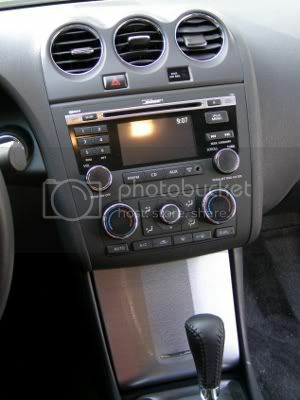 Speaking of stereos, the Altima had a nine-speaker Bose sound system with XM radio and a USB port with iPod connectivity. A very nice system, indeed—great bass. This was part of the Premium package, which also included Xenon headlight, the RearView Monitor, dual climate control, and the best Bluetooh system I've used yet. It was truly a breeze to connect my phone, and it also had voice recognition. Other features included push-button starting, traction and stability control, Homelink Universal Transceiver, and a multi-function trip computer. 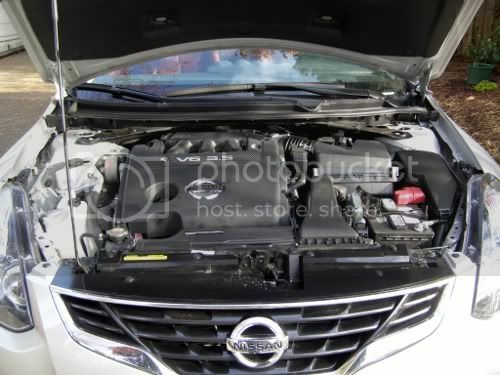 The Altima 3.5SR makes 270 horsepower 258 lbs./ft. of torque. Having just come out of an Acura TSX V6, which made 280 horsepower, I expected the Altima's 3.5-liter V6 to feel equally gusty. Unfortunately, it just didn't feel that fast, even though the 0-60 figures are very similar (somewhere right around 6 seconds). The CVT worked well, and did offer a manual shifting capability by moving the gear shift forward and back. There is also a sport mode. The engine and transmission were smooth and comfortable. As far as mileage goes, I got 22 MPG in a mix of city and highway driving. The EPA rating is 20 city, 27 highway. The car sort of drives the way it looks: Almost sporty. Step on the gas, and it just didn't seem all that anxious to get going, even in the sport mode. Part of this could be due to the fact its mated to a CVT instead of a traditional automatic (or the six-speed manual). On the freeway, however, the V6 did show a willingness to perform, as there was more than ample passing power. Although it's curb weight isn't too portly at 3,333 lbs., it was not nimble. It is the open road in which the Coupe is most at home. It cruises comfortably, has good seats and plenty of passing power. The front and rear independent suspensions and 18-inch wheels/tires offered an average ride. But for me, this car was not all that exciting to drive. It just didn't get the adrenaline flowing. It's not really sporty, it's not that fuel efficient, it's not practical, and in my opinion, not that great looking. 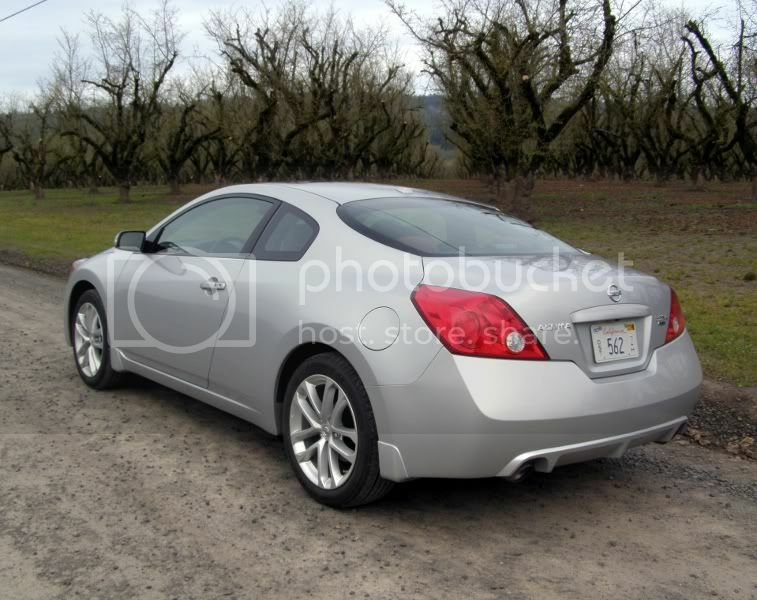 The Nissan Altima 3.5SR Coupe just doesn't do it for me. There's nothing wrong with the car, but there just isn't enough right with it, either. Other than its great looking interior and easy-to-use technology, the car didn't have many high points for me. Nissan buyers wanting sports cars will buy RWD vehicles, such as the 370Z; buyers wanting more space will opt for the Altima sedan, or an SUV like the Rogue or Murano. With that being said, it still remains a mystery to me why the company would offer up a mid-size FWD coupe in a segment that has nearly disappeared. Between the RWD sports cars getting more civilized, the C-segment coupes getting more refined and both C- and D-segment sedans getting a lot more stylish, these big FWD coupes are just getting totally squeezed out. On to the Transit Connect, then!